I forgot what it was like to be without air conditioning when the sun is blistering away outside. For the most part, pop open some windows for fresh air and you are good to go in London. But it just won’t cool down! I’m not complaining, per se, just drinking my tenth ice water, sitting immediately in front of the fan, and typing very slowly in this sweltering heat. Gertie is spread out on the floor below me, moving to a new cooler patch every 10 minutes or so when her body warms up her current spot. But you know what, I’ll take it. It’s summer. And in two weeks, Chris will finally have vacation! He’s hoping to take off almost all of August, since his vacation days expire September 1st and he’s barely been able to take off three days so far. We have a few trips planned, including three nights in Belgium, a week back in the US, and a day in Paris. But we are also hoping to enjoy some of the English countryside and our own backyard! I’m on Amazon right now ordering a kiddie pool, by the way. No joke. I still have a few weeks to wait until I can officially enjoy a summer vacation, so in the meantime, I will have to use food to cook up that summer feeling. 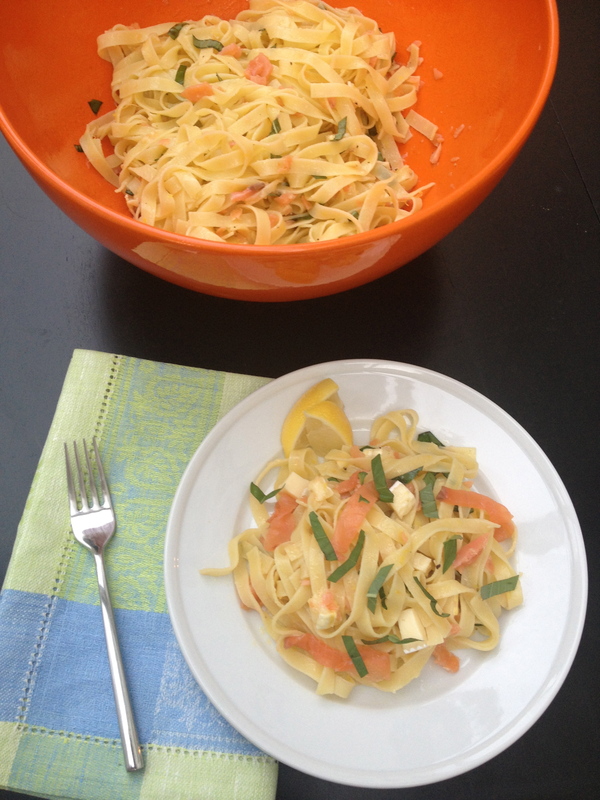 When I was younger, I was visiting family friends in Seattle and had the absolute best summer pasta dish. I have since recreated versions of it until I have come up with the perfect combination of flavors. 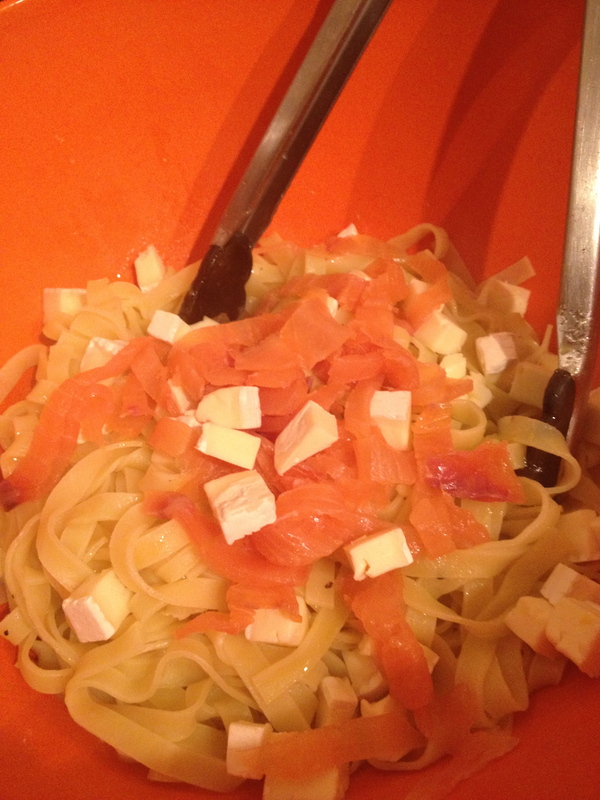 The two main components are smoked salmon and brie cheese. The Pacific Northwest has amazing salmon, but so does Scotland, so we are in business! 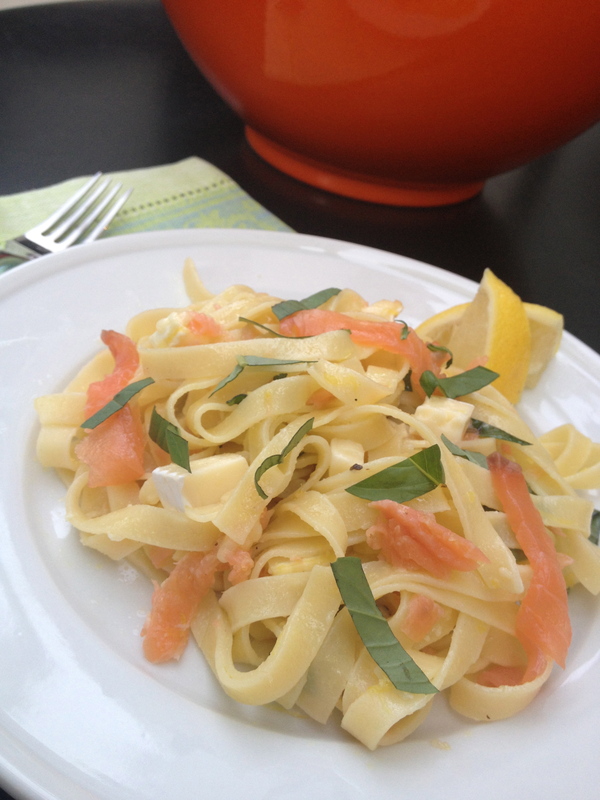 Buttery, flaky, and bright, it pairs perfectly with fresh lemon citrus and basil in the pasta. And this is the perfect dish to enjoy with a cold glass of white wine. 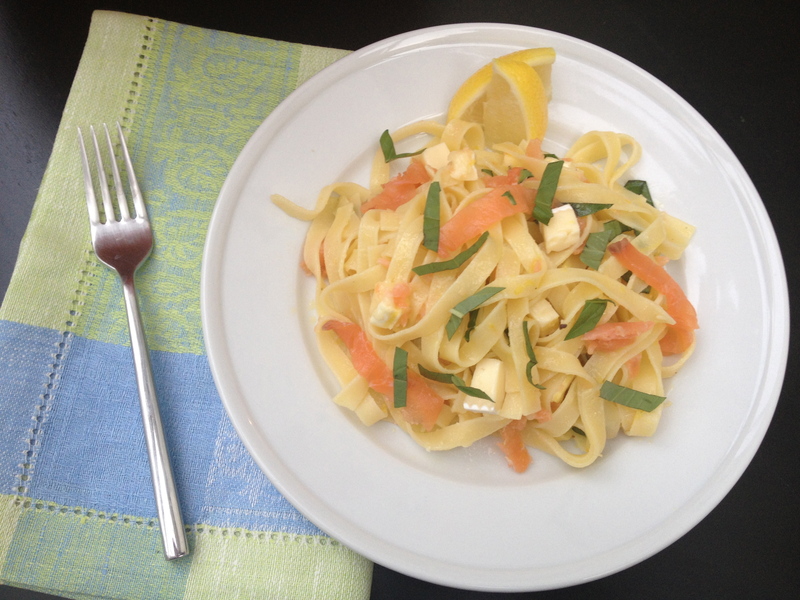 Plus it’s a great dish for a hot night because the only cooking involved is boiling pasta. Plus I think fresh pasta is best here, which only takes a couple of minutes. This dish comes together fast, making it perfect for a weeknight, but it’s so fresh, you’ll feel like you’re on vacation! I throw the brie in the freezer while I prep the rest of the dish. This will make it much easier to cube. Then you’ll just toss your hot drained pasta with a lemon olive oil dressing and the cheese, which will just begin to melt and coat the yummy strands. You can serve this immediately, at room temperature, or cold. Place the brie cheese in the freezer and chill for 10 minutes. Bring a large pot of water to a boil and cook pasta according to packaging, about 3-4 minutes for fresh pasta. Drain and reserve. Meanwhile in a large bowl, zest and juice the lemons. Whisk with the olive oil and season with salt and pepper. 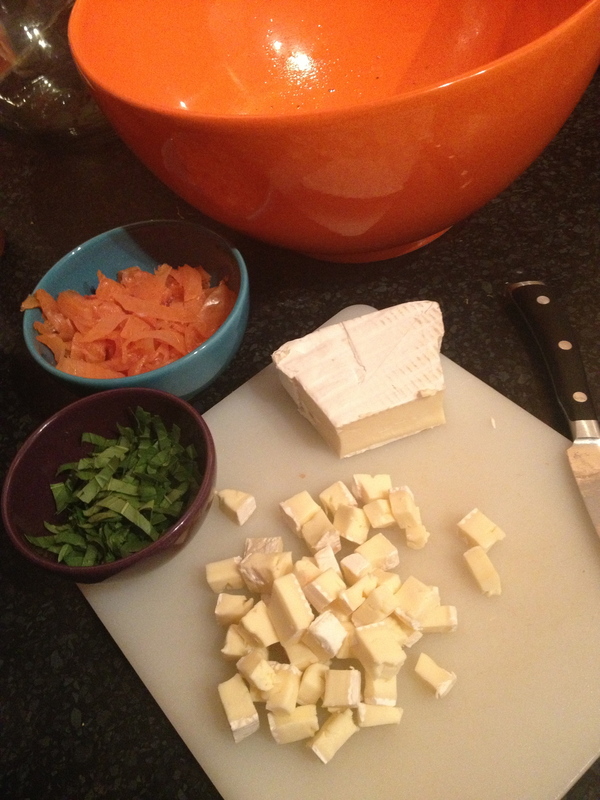 Dice the cold brie cheese into small pieces, about ¼ inch. Add to the bowl and toss with the hot pasta. Mix in the salmon. Add the basil just before serving.